Impacted by the weakening global economy, Apple’s iPad shipments in the third quarter did not meet its forecast and only reached 13 million units with a sequential growth of 36.8%. This could explain recent claims by J.P. Morgan’s Asia team which caused quite a commotion saying Apple cut holiday quarter iPad orders by 25 percent, even though J.P. Morgan quickly distanced themselves from that report. Underwhelming or not, the fact remains that the 13 million iPads account for a healthy 70 percent of the entire tablet market this quarter. Meanwhile, due to their inability to attract consumers, most non-iPad tablet PCs suffered from high inventory issues in the third quarter. In addition, many new tablet PC product launches have been delayed. 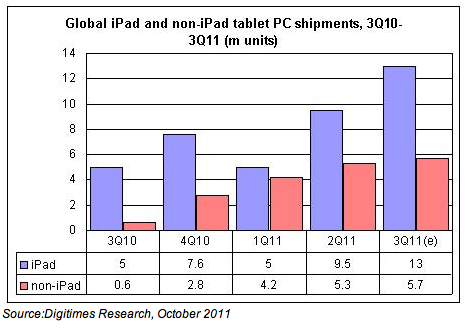 As a result, shipments of non-iPad tablet PCs only grew 10.1% sequentially in the quarter. In the U.S., three out of four tablets sold are iPads. Apple is due to report September quarter earnings today after the closing bell so the mystery surrounding iPad shipments will be cleared up soon. We think can change the way teachers teach, and kids learn. In fact, every state in the U.S. now has an iPad pilot program, or are deploying one.